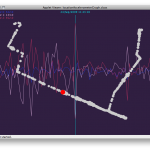 Rolling the extra logged sensor data into the GPX export took more effort that it should have…but I uncovered and fixed a latent bug in the export feature, so that’s a win right? 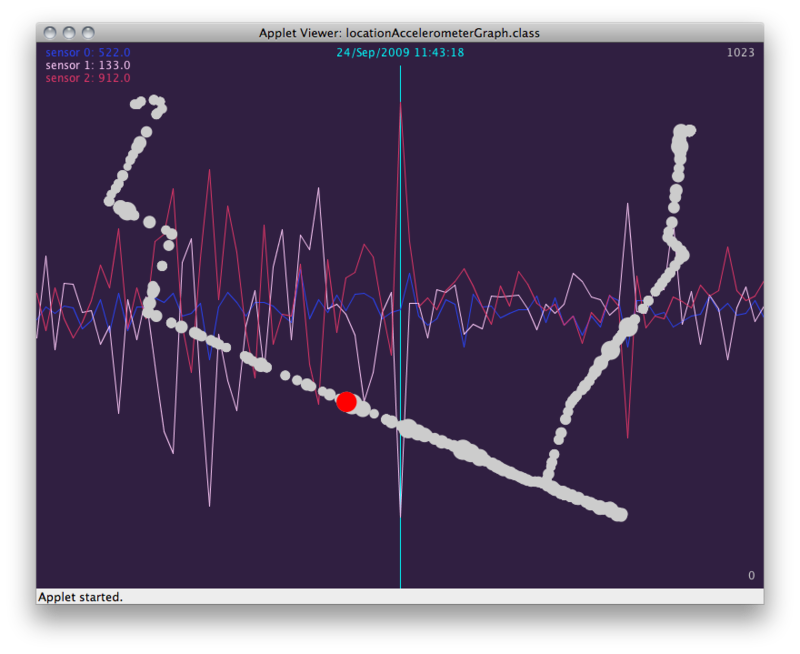 Regardless, it’s was nice to use the new issue tracker at bugs.robertcarlsen.net for real(z) for the first time. I’m looking to get several other features implemented before the next released update…planning on a few weeks. Otherwise, code is available, as always, on github. 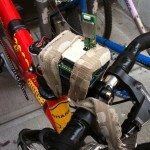 I’m logging the acceleration forces at the handlebars of my bicycle while riding through New York City. The body has roughly three contact points with a bicycle, the hands at the handlebars, the “seat” at the saddle, and the feet at the pedals. The downward force of the rider’s weight and pedaling force and the upward forces of the bicycle rolling over uneven ground are distributed over these three points. I was interested to see just what kind of forces are “pushing back” that I may not be aware of, myself lost in the act of simply keeping the bicycle upright and safely navigating through traffic. 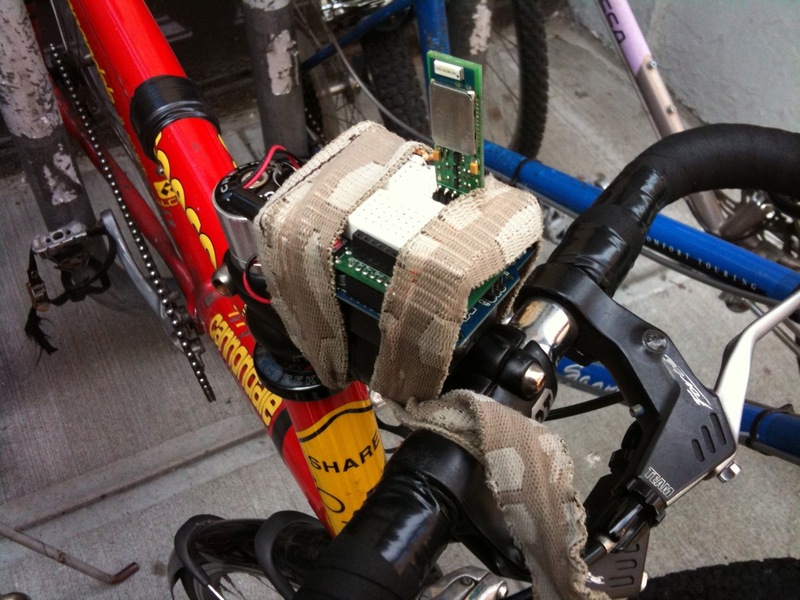 This is geocoded accelerometer data from the handlebars of my bicycle on my commute from Greenpoint to ITP in the East Village. The sample at middle of the graph, and the red circle on the path coincide. I realized just now that this is a seam in the Williamsburg Bridge. Neat. I’ve wanted to try another geocode mashup since the Where We Were project I ran at Moore College. I recently picked up a GPS unit, which got me thinking about it anew. For the M5 Bus trip assignment for our Applications class I worked up a mix of Twitter, GPS location, digital photos and Google Maps. 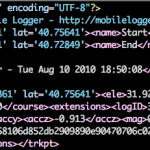 I had previously synchronized the clocks for the camera, phone and TomTom GPS unit…and used these timestamps later to literally mash the Twitter XML and TomTom GPX files together with a custom Java application. Geocoding the photographs was done using the gpsdings java application. Google Maps will display carefully formed KML (Keyhole Markup Language) files, which is nice because Google Earth can open the same file. The project is available at http://robertcarlsen.net/m5. Although this entry is focused specifically on the technical side, I welcome comments here on the thoughts presented on the project page.